A former leading jihadi ideologue and long-time colleague of al-Qaeda’s Dr. Ayman al-Zawahiri has published a new book that examines the future of the conflict in Afghanistan. Egyptian native Dr. Fadl (a.k.a. Sayyid Imam Abd al-Aziz al-Sharif) was a founder of the Egyptian Islamic Jihad organization (aljarida.com, November 27, 2007; see also Terrorism Monitor, December 10, 2007). After a falling out with al-Zawahiri in Pakistan, Dr. Fadl moved to Yemen, where he remained until he was deported to Egypt after 9/11 to begin a lifetime prison sentence. While in prison, Dr. Fadl published a seminal document on the re-examination of al-Qaeda’s global jihad, entitled Tarshid al-amal al-jihadi fi misr wa al-alam (Rationalizing the Jihadi Action in Egypt and the World). Known popularly as the “Revisions,” Dr. Fadl’s work became the first in a series of similar “revisions” to emerge from imprisoned militants in the Muslim world. Previously, Dr. Fadl had been best known as the author of an important jihadi manual, 1988’s Al-omda fi i’dad al-udda (The Master in Making Preparation [for Jihad]), which he initially published under the name Abdul Qadir bin Abdulaziz. Dr. Fadl’s new book is entitled Future of the War between America and Taliban in Afghanistan and has been carried in excerpts by the pan-Arab daily al-Sharq al-Awsat. The new work is highly critical of Osama bin Laden, whom Dr. Fadl accuses of manipulating the Taliban in his own interest before 9/11, eventually causing their downfall through his treachery. 1. A successful jihad must be accompanied by a religious reform movement. The religious motivation of the Taliban (as opposed to tribal loyalties or the pursuit of wealth) meets this criterion. 2. The Taliban cause is just, as it seeks to repel foreign occupation. Dr. Fadl points to the examples of the American Revolution, French resistance to Vichy and Nazi rule and the anti-Japanese resistance movements in Asia during World War Two. 4. Jihad has popular support from the people of Afghanistan, who provide fighters with support, shelter and intelligence. 7. As the battlefield widens beyond the Taliban strongholds in the south, occupation forces must face increasing financial and personnel losses. 9. Suicide operations make up for the shortage of modern weapons. 10. After three decades of nearly continuous warfare, Taliban fighters and leaders have the necessary experience to prevail against the occupation. 11. History is also on the Taliban’s side. Despite being world powers, both the British Empire and the Soviet Union failed to conquer Afghanistan. 12. Pakistan’s support of the Taliban provides the necessary third-party refuge and supplies to any successful guerrilla struggle. Has al-Qaeda Started a Feud with the Tuareg? 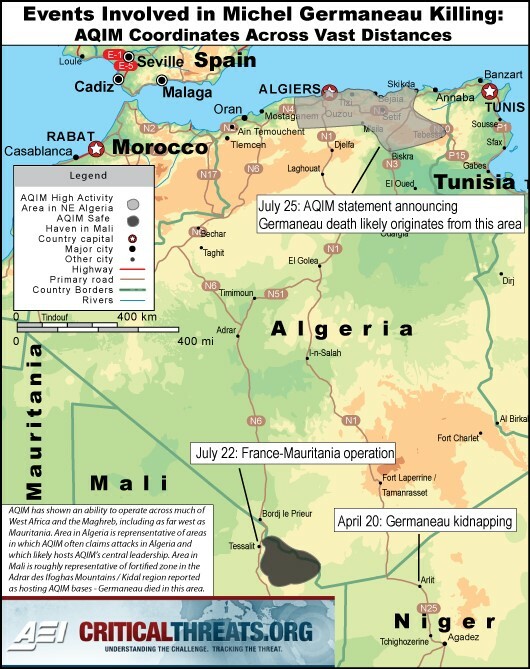 Fallout continues in North Africa from the July 22 raid on elements of al-Qaeda in the Islamic Maghreb. The joint operation by French and Mauritanian security forces on Malian territory was intended to free 78-year-old hostage Michel Germaneau. The raid failed and Germaneau was killed in retaliation, but six AQIM operatives were killed by security forces, infuriating AQIM leaders, who continue to hold two Spanish hostages in northern Mali. An AQIM statement described the six dead al-Qaeda members as being three Tuareg, an Algerian, a Mauritanian and a Moroccan (Reuters, August 16). Abd al-Hamid (Hamidu) Abu Zaid, an AQIM commander responsible for a number of kidnappings and for the execution of British tourist Edwin Dyer, is reported to be suspicious that the Tuareg provided the precise information that enabled the joint commando force to locate and kill the six AQIM operatives. Abu Zaid took his revenge by abducting and murdering a Tuareg customs officer named Mirzag Ag al-Housseini, the brother of a senior Malian Army commander, Brahim Ag al-Housseini (El Khabar [Algiers], August 12). No ransom was sought for the captive, who was executed on August 12 (Radio France Internationale, August 13). A soldier abducted at the same time as Mirzag and another abducted civilian were released by AQIM on August 16 (AFP, August 16). The leader of AQIM in Mauritania, Abu Anas al-Shanqiti, warned that AQIM would carry out reprisals against the “traitorous apostates, children and agents of Christian France” as a result of the raid (Agence Nouakchott d’Information, August 16; AFP, July 24). The French Ministry of Foreign Affairs responded to these “threats uttered by assassins” by announcing that France’s security apparatus was “fully mobilized” (Le Monde, August 17; AFP, August 17). Reports from Mali claim President Amadou Toumani Touré “is seething” over the Franco-Mauritanian commando operation in northern Mali. The President was apparently not informed of the operation in advance, nor were Malian forces called on to participate (Jeune Afrique, August 16). Mali is still struggling with a simmering Tuareg insurgency in its vast and poorly controlled northern region. Colonel Hassan Ag Fagaga, a noted Tuareg rebel, has threatened to resume the insurgency if the government does not implement the terms of the 2008 Algiers Accord (El Khabar, July 15). Colonel Ag Fagaga brought 400 Tuareg fighters in for integration with Mali’s armed forces in 2009. He has already deserted twice to join the Tuareg rebels in the north. Al-Qaeda has tried to ingratiate itself with the disaffected Tuareg of northern Mali but has had only marginal success. Some former rebels have even offered to form Tuareg counterterrorist units to expel the mostly Arab al-Qaeda group from the region. As Rwandan President Paul Kagame enjoys an easy triumph at the polls this week with 93% of the vote, he is sure to be casting a wary eye at a possible alliance between his former army chief-of-staff, Lieutenant-General Faustin Kayumba Nyamwasa, and Rwanda’s former intelligence director, Colonel Patrick Karegeya. Both men fled Rwanda this year for Johannesburg, from where Kagame’s government claims they are involved in organizing grenade attacks in Rwanda’s capital of Kigali. Despite police reports that suspects apprehended in the grenade attacks belong to the Hutu-based Forces Démocratiques de Libération du Rwanda (FDLR), Rwandan prosecutors claimed General Nyamwasa and Colonel Karegeya were behind the violence. Prosecutor General Martin Ngoga said the men had linked up in South Africa, where they are alleged to have “planned and started implementing acts aimed at creating state insecurity… these acts include hurling grenades in Kigali city and other places” (Rwandan News Agency, July 2). Karegeya is one of many Tutsis born in exile to have become allied with Yoweri Museveni’s Ugandan National Resistance Army (NRA) before he played an important role in sweeping the Hutu out of power in Rwanda in 1994. After studying law at Kampala’s Makerere University, Karegeya became a member of Museveni’s NRA in 1982. He was arrested by Ugandan intelligence while trying to go to Libya for military training and remained in the Luzira Maximum Security Prison until he was released following the overthrow of Milton Obote in 1985. Karegeya rejoined Museveni’s forces as they toppled Obote’s successor, General Tito Okello. Karegeya then served as director of Rwanda’s External Service Organization (ESO), the national intelligence service, from 1994 to 2004. 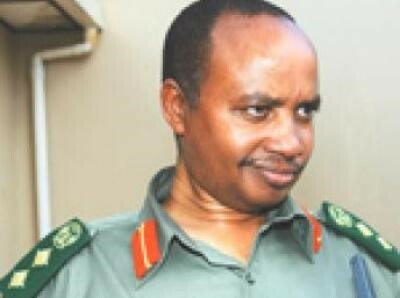 Karegeya played an important part in intelligence operations against his former Ugandan patrons in clashes with the Forces Rwandaises de Défense (FRD – the national defense force) in the Democratic Republic of the Congo (DRC) between 1998 and 2003. According to Karegeya, “Fighting the enemy you know [the Ugandan People’s Defense Force – UPDF} was especially very challenging” (The Observer [Kampala], August 2). In 2005 Karegeya was brought up on charges of insubordination and desertion. He was stripped of his rank in 2006 and spent 18 months in jail, mostly in solitary confinement in Kigali’s Mulindi Military Prison. We fought for the liberation of Rwanda so that Rwandans can enjoy peace and be delivered from dictatorship, but we have not seen that. A dictator can never step down, they are brought down. It’s only Rwandans who can stand up now and fight for their freedom. Kagame will have his breaking point and I think it will be very soon (Observer [Kampala], August 2). General Nyamwasa was also a veteran of Museveni’s NRA before joining the Rwanda Patriotic Army in its post-genocide conquest of Rwanda in 1994. He served as army chief-of-staff until 2002 and then became national security chief. After reportedly being tied to a failed coup attempt in 2003, Nyamwasa went into a comfortable exile as ambassador to India. Since fleeing to Johannesburg after his return to Rwanda earlier this year, Nyamwasa has been accused by the regime of financial improprieties, military incompetence and abandoning his comrades on the battlefield, though the intense criticism has led some to wonder how such a man could have been chief-of-staff for so many years. In May General Nyamwasa told a Ugandan daily that Kagame’s focus was no longer on the Party and the country, but on Kagame himself. He stated, “[Our] disagreements are centered on governance, tolerance, insensitivity, intrigue and betrayal of our colleagues… I saved President Kagame’s life twice during the struggle when everyone else had abandoned him in Nkana and Kanyantanga. 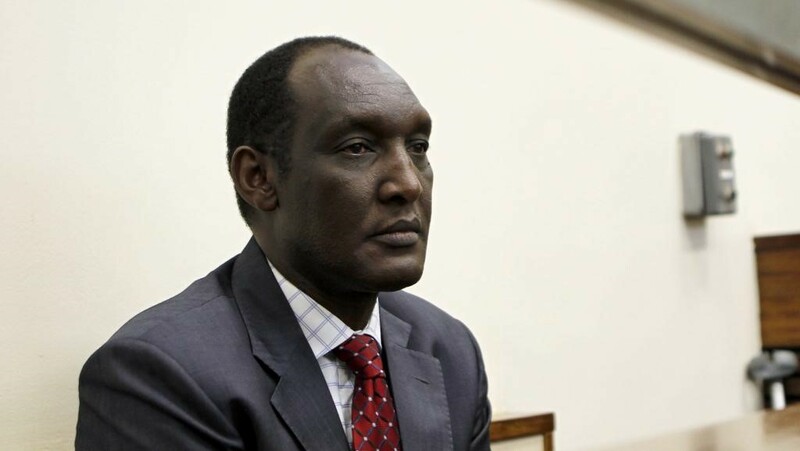 Where were all those who are telling him that I am a traitor?” Nyamwasa says he and Karegeya are both lawyers and are fully aware that Kigali has no extradition treaty with South Africa, and that “there is no evidence whatsoever that links us to the bombing in Kigali” (Daily Monitor [Kampala], May 30). General Nyamwasa was shot twice in Johannesburg on June 19. Though shot in the stomach, he survived by grabbing the gunman when the third round jammed in the assailant’s weapon (Daily Monitor, June 19). South African prosecutors arrested five men in the assassination attempt but have refused to identify their nationality. Kigali has demanded their extradition while denying any role in the assault, but South Africa instead recalled its ambassador in Kigali on August 5 to express its displeasure over the incident (AFP, August 5; al-Jazeera, August 10). In an interview with the pan-Arab Quds Press news agency, Shaykh Salman bin Fahd al-Awdah warned that a wave of terrorism will follow any military attacks on Iran while also calling on Tehran to end attempts to expand its influence in the Sunni world (Quds Press, August 2). Shaykh al-Awdah is one of the most popular religious scholars in Saudi Arabia. After making his mark through the once-popular use of cassette tapes to distribute sermons, al-Awdah has since moved on to more modern methods of communication as the director of the Islam Today website. He also makes frequent appearances on television and in the commentary sections of Arabic language newspapers. Born in Qaseem Province from a Najdi family, Shaykh al-Awdah was one in a new generation of “political preachers” that emerged after the 1990-1991 Gulf War and the establishment of American bases in the Arabian Peninsula. Al-Awdah became associated with the religious opposition to the Saudi regime and suffered a five-year prison term as a result of his challenges to official fatwa-s permitting the regime to invite American troops to the Kingdom and his criticism of the expensive but ineffective Saudi military. Bin Laden was a supporter of al-Awdah in the 1990s and has quoted al-Awdah’s work in various communications. However, after his release al-Awdah devoted himself to a Ph.D. study of the Sunnah and transformed himself into a paragon of clerical respectability. He is now considered to be under the protection of the regime. Al-Awdah rejects the “stereotype” that ties the da’wah (“call,” i.e. to God) of the 18th century reformer Shaykh Muhammad bin Abd al-Wahhab to terrorism. The shaykh’s followers are best known as Wahhabists, though Salafists in Saudi Arabia and elsewhere do not use this term themselves. According to al-Awdah, al-Wahhab’s insistence on Koranic authenticity in life and worship provided stability in a region where disunity and tribal fighting were previously common. “When the events of September took place in the United States [i.e. 9/11], people started saying that these acts were the product of the da’wah of Shaykh Muhammad bin Abd al-Wahhab. The truth is that this da’wah is totally innocent of these acts…,” stated al-Awdah. The preacher goes on to note that “misinterpretations happen, even in Islam.” In an apparent reference to those militants who insist jihad is an individual obligation for Muslims, al-Awdah says, “Some people rely on the Koran to say that Islam wants to send the whole world to the battlefield. Those people have a twisted understanding of those acts [of terrorism]. The countries of the Islamic world in Egypt, Saudi Arabia, Iraq, Somalia and others are victims of these acts.” He insists 99% of Muslims are “removed from extremism and violence.” The militant remainder should be engaged in an Islamic discourse based on religious texts, but one that also considers the reasons behind the creation of a climate of terrorism, such as foreign aggression against Muslim countries. I fear Shi’i Iran. All those who are loyal to Iran should tell it that its expansionist approach will hurt it. Iran has the right to live peacefully and to obtain the latest technologies. However, it does not have to have the desire for expansion, as is the case in Africa and the so-called Shi’i penetration of the Sunni world. This does not serve the Iranian people. In a recent interview with a pan-Arab daily, Shaykh Khalid Abd al-Nabi (a.k.a. Khalid Abdulrab al-Nabi al-Yazidi), the leader of Yemen’s Aden-Abyan Islamic Army (AAIA), condemned the Southern secession movement as the work of “Jews and Christians,” while claiming he was the victim of accusations by “atheistic communists” who had infiltrated the Sana’a government (al-Quds al-Arabi, July 9, 2009). The AAIA was established in the early 1990s by Abu Hasan Zayn al-Abadin al-Mihdhar. 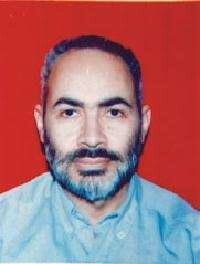 When al-Mihdhar was executed in 1998 for his role in the deaths of four Australian and American tourists, al-Nabi took over leadership of the group (al-Hayat, October 11, 2005). A member of the Yafa’i tribe and a native of the al-Yazid district of Lahaj Governorate, al-Nabi left socialist-ruled South Yemen in the 1980s for religious training in Saudi Arabia. In 1994 he received military training from the Taliban in Afghanistan but returned to Yemen to participate in the civil war against the South Yemen socialists. After this he became a senior member of the AAIA. 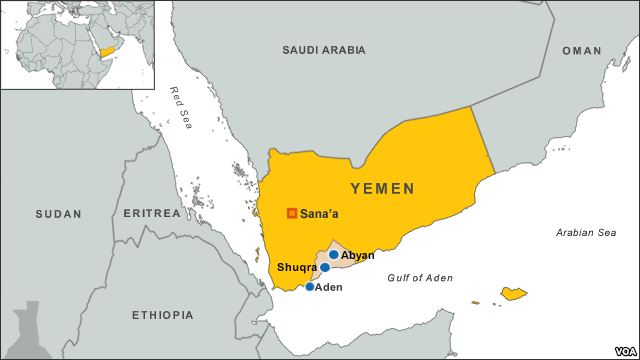 By 2003 al-Nabi was leading his followers in clashes against government forces in the Hutat Mountains of Abyan Governorate. According to al-Nabi, the “atheistic communists” of South Yemen had merely been dispersed rather than defeated in the civil war. “Some remained in Yemen as members of the opposition, others became members of the opposition outside Yemen, and some donned the garb of the state and joined the ruling [General People’s] Congress Party. Outwardly, these people pretended to owe allegiance to the Congress Party but inwardly they owed their allegiance to the socialist party,” stated al-Nabi. In 2005, al-Nabi turned himself in to authorities and received an official pardon. He was released to his farm where authorities maintained he was leading a peaceful life despite numerous reports he was raising and training an Islamist militia. Al-Nabi has repeatedly denied having ties to the government, especially Major General Ali Muhsin al-Ahmar, the president’s brother and commander of Yemen’s First Armored Brigade (Asharq al-Awsat, April 4, 2006; January 8). Though resolute in his advocacy of national unity, al-Nabi has elsewhere acknowledged there are numerous problems facing the people of southern Yemen, including “injustice, racism, usurping the money of the people, looting the land, oppression, barbarism, the use of violence and force, a corrupt judiciary, corrupt security, and many other reasons. In fact, if we look at the situation of the people in the southern regions, you might excuse them for demanding secession” (Asharq al-Awsat, January 8). Shaykh Nur ul-Haqq Mujahid bin Mohamed, the Taliban military commander in the Maydan Shahr district of Wardak province, stated in a recent interview that Taliban forces are trying to block a major supply corridor south of Kabul and “close it permanently.” One of Afghanistan’s most important highways passes through Maydan Shahr, connecting Kabul with the Taliban stronghold of Kandahar. The interview appeared in the 44th issue of al-Somood, the monthly magazine of the Islamic Emirate of Afghanistan (posted to jihadi websites on July 22). In the prologue to the interview, Shaykh Nur ul-Haqq is described as a high-standing graduate of a Peshawar theological school who joined the Taliban movement in its early stages in the mid-1990s, eventually becoming head of military security in Nangarhar province. He has been in charge of military operations in Maydan Shahr since 2002. According to the Taliban commander, the “Crusader” forces in Maydan Wardak have military positions in the provincial capital of Maydan Shahr as well as at various points along the Kabul-Kandahar highway. “Battles between the mujahideen and the Crusaders occur to control the corridor and the two sides will swap control of it during the day, but at night the mujahideen will take complete control of it and all the roads leading to the district,” stated the shaykh. Fighting in Maydan Wardak can be difficult, the Taliban commander admits. 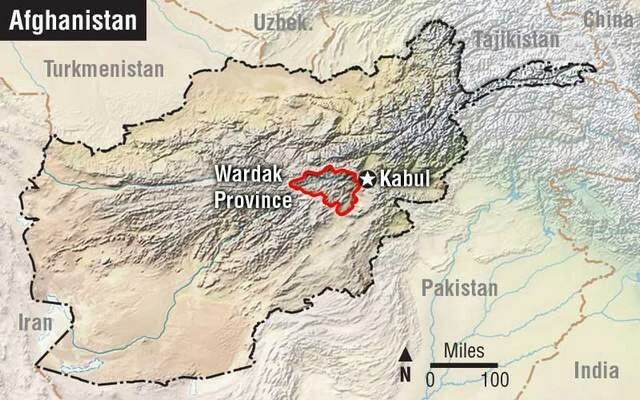 The “huge capabilities of the enemy” are posed against the limited resources of local fighters, and the district’s close proximity to Kabul makes it easy for the Coalition to move troops quickly to Maydan Wardak in response to any Taliban attack. Despite this, the shaykh affirms that successful attacks on military and supply convoys continue in the district. For example, in Kunar and Nuristan provinces, the most suitable military method is a military clash because those two provinces possess a geographic situation suitable for this military strategy. Meanwhile, in Helmand and the southwest of Afghanistan the preferred method is to plant mines and use explosives because the terrain of those areas is desert terrain, which does not afford the mujahideen secure places to hide. As for Kabul, martyrdom operations and surprise attacks are best because the open concentration of large numbers of invaders there gives the mujahideen an opportunity to launch those kinds of campaigns against their bases and barracks. For now, however, Shaykh Nur ul-Haqq’s focus on closing the highway through Maydan Wardak may be disrupted by an outbreak of fighting between the Taliban and their former ally, the Hizb-i-Islam militia of Gulbuddin Hekmatyar (Weesa [Kabul], July 26). Mullah Zabiullah, a Maydan Wardak Taliban commander, was reportedly killed in separate fighting with Afghan security and intelligence forces on July 31 (Bakhtar News Agency, July 31).